Although DIY home security cameras can seem interchangeable, no model is suitable for every need. 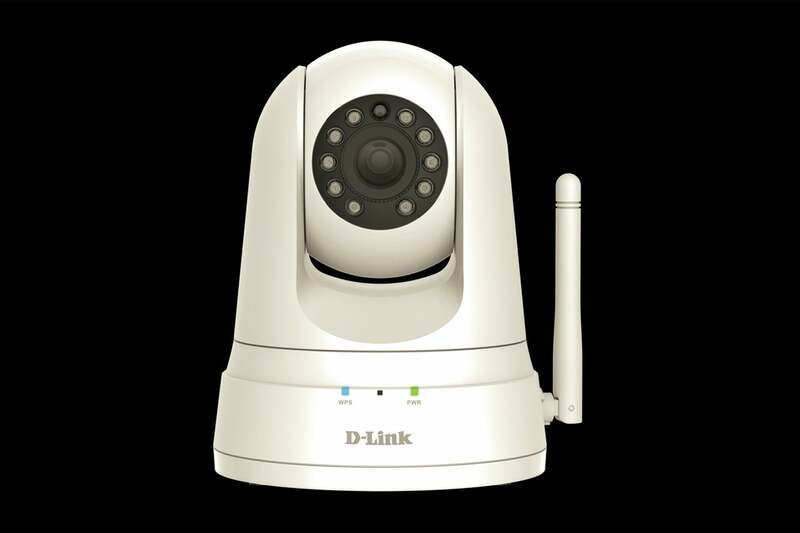 It’s a fact D-link has capitalized on by offering an array of models, from basic nanny cams to serious surveillance models to weatherproof cameras for outdoor monitoring. It recently expanded its offerings with the DCS-5030L HD Pan & Tilt Wi-Fi Camera, aimed at users with big rooms or active kids and pets to keep an eye on. It’s not the most attractive camera we’ve seen, but what it lacks on looks it makes up for in features. With its bulky dome shape, circle of lights, and prominent antenna, the DCS-5030L resembles something out of a 1950s space-art poster. Its wide base allows you to set it on any flat surface without worrying it will tip over. You can also give it a more permanent spot on your ceiling with the included mounting bracket. In either case, it’s going to be pretty conspicuous; this isn’t a camera that blends easily with home decor. The camera has a 110-degree field of view and is ringed with 10 LEDs that provide up to 16-feet of night vision in complete darkness. It can cover even more area when you use its pan-and-tilt feature. This is controlled with the mydlink Lite companion app and provides up to 340 degrees of pan and 120 degrees of tilt. The DCS-5030L can pan 340 degrees and tilt 120 degrees. With the DCS-5030L, you can opt to record 720p video continuously, on a schedule, or only when sound or motion is detected. As with all of D-Link’s DIY security cameras, video is recorded locally to a microSD/SDXC card (up to 128GB; no card is included). 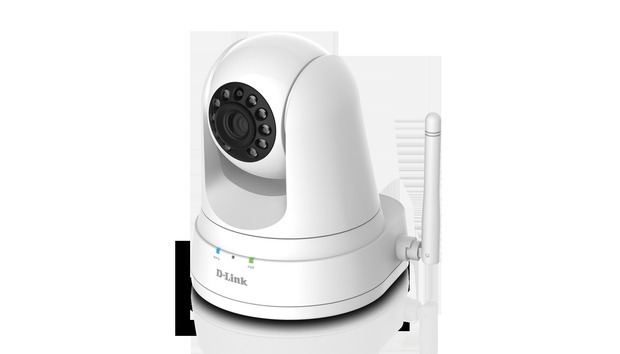 D-link boasts this saves you the cost of a monthly or annual cloud subscription, which is true enough, but it also carries the risk that if a burglar takes the camera or the card, you’ll lose all forensic evidence of the break-in. If you have a D-Link cloud router, you’ll be ahead of the game when it comes time to set up the DCS-5030L. You just press the WPS button on the camera, then on your router, and it will automatically assign your network settings to the camera. Even without a D-Link cloud router—as I was—setting up the DCS-5030L is fairly painless. You can connect it to your network wirelessly or with the provided ethernet cable. The mydlink Lite app walks you through the steps for either method, and the whole process can be done in less than five minutes. Once setup is complete, you’ll see the camera’s live feed on the app’s home screen. Along the bottom are buttons for turning the audio on and off, taking a screenshot of the feed, manually triggering video recording, and operating the camera’s pan and tilt. You access the camera’s settings from the three-dot menu in the top right corner. The mydlink Lite app lets you pan and tilt the DCS-5030L incrementally with directional arrows. The last is where you can customize motion and sound detection to minimize false alerts. The app allows you to enable/disable sound and motion detection independently of each other, which gives you some flexibility. You can also define motion detection areas by tapping squares on a grid overlaying the camera image. This allows you to monitor activity only around ingress/egress points rather than the entire room, for example. You can also adjust the push notifications themselves, enabling them for both motion and sound, motion only, or turning them off completely. Once I had everything customized to my liking, I found the detection alerts pretty accurate. With each alert, you’re presented with an option to go directly to the camera’s live view. Image quality is clear, though not as detailed as some other cameras, and it had none of the edge warping that often results from wide-angle lenses. The audio was also strong, clearly picking up action that was happening off camera. The camera’s marquee feature, though, is its pan-and-tilt and I had mixed results with it. The app offers two methods of operation, which you can toggle between using the button on the home screen. The first method is to use gestures—you swipe your finger across the camera image in the direction you want to camera to go. This allows you to cover large swaths of a room, sometimes too large. As often as not, swiping in a given direction sent the camera to the end of its travel whether that’s what I wanted or not. There is an indicator that pops up when you hold your finger on the screen that moves as you move you finger to help you make more precise gestures. It’s not very intuitive, however, and it rarely helped me get the result I wanted. The other method, when activated, places an overlay of eight arrows on the image—at the four cardinal points and the four corners—with a circle at the center. Tapping any of the arrows moves the camera incrementally in that direction and tapping the circle brings the camera back to its home position. This provided much more accurate control, whether I just wanted to reposition the camera or track my dog through the living room. If you have a big home or office space to monitor, the DCS-5030L is a great option. Its pan-and-tilt function is smooth and responsive and gives you an easy way to cover a lot of ground without investing in multiple cameras. And the breadth of customization options will help keep security tight and false alarms to a minimum. It would nice if the DCS-5030L included a cloud backup option to secure your surveillance footage, but if that’s not a deal-breaker, you shouldn’t hesitate to bring this camera home.